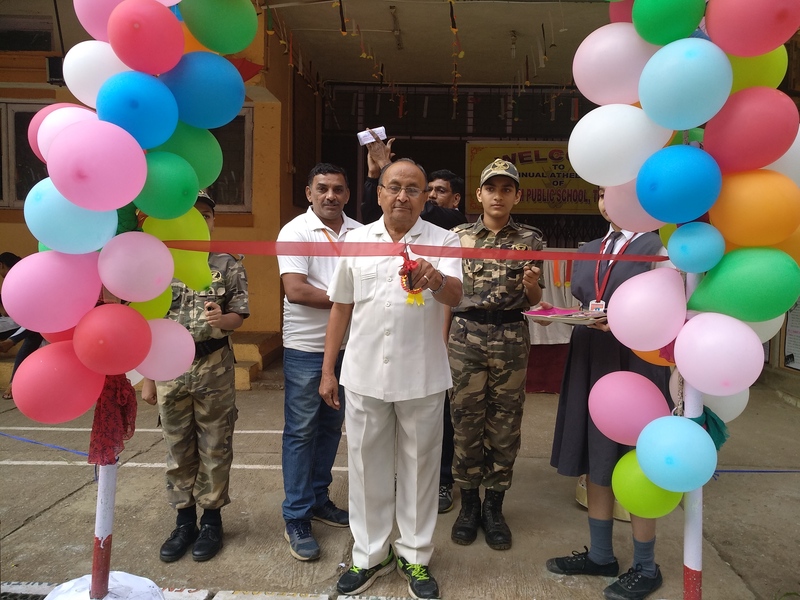 The School provides facilities for taking part in sports and games such as Badminton, Basket Ball, Volley Ball, Carrom, Chess etc. 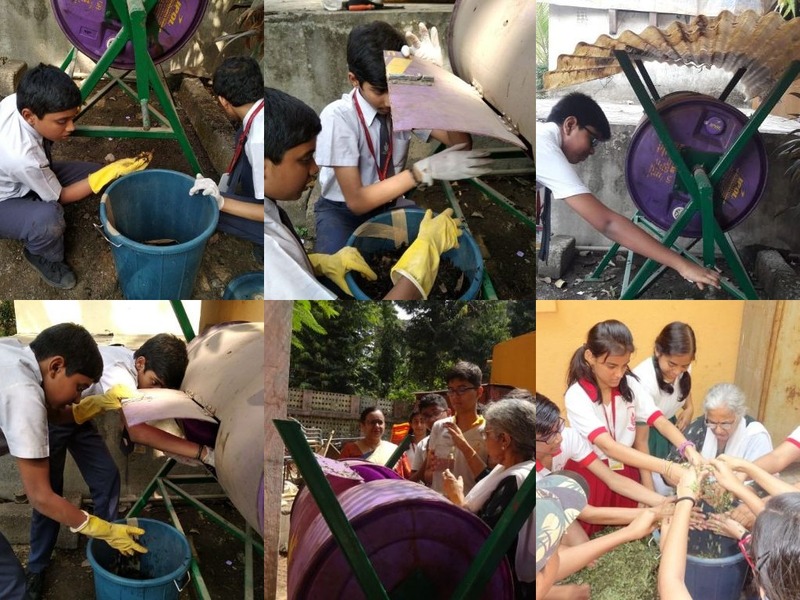 Experienced coaches impart professional training to the students on regular basis. We have a Table Tennis Room as well as Basket Ball Court. 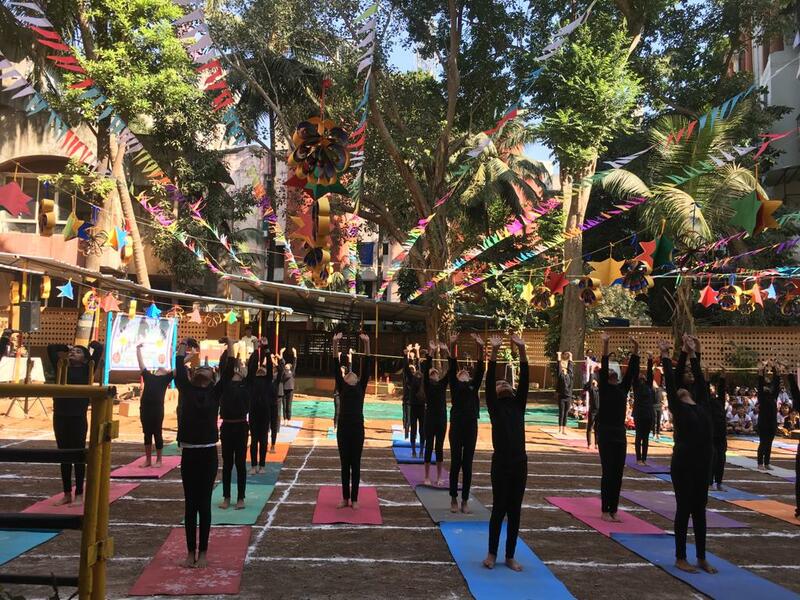 Beside this, Yoga and Pranayam are being taken in regular PT periods as per schedule. 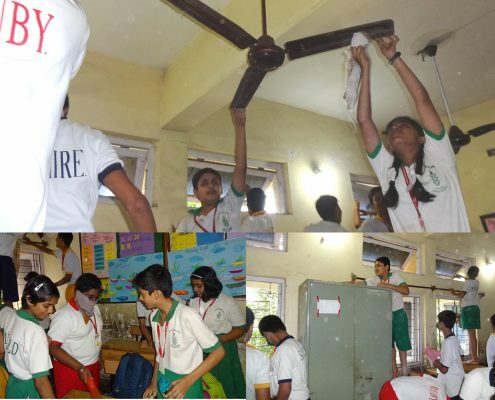 Moreover, Annual Sports Meet is organized to display excellence in different sporting events. 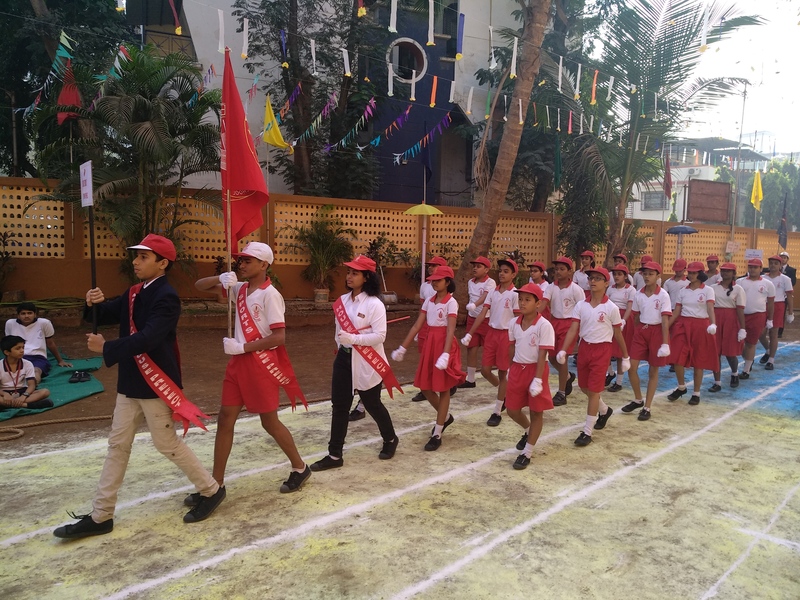 The 25th Annual Athletic Meet of Pre-Primary Section, Primary Section & Secondary Section were organized on 18th December 2018, 19th December 2018 & 19th January 2019 respectively with zest and excitement. 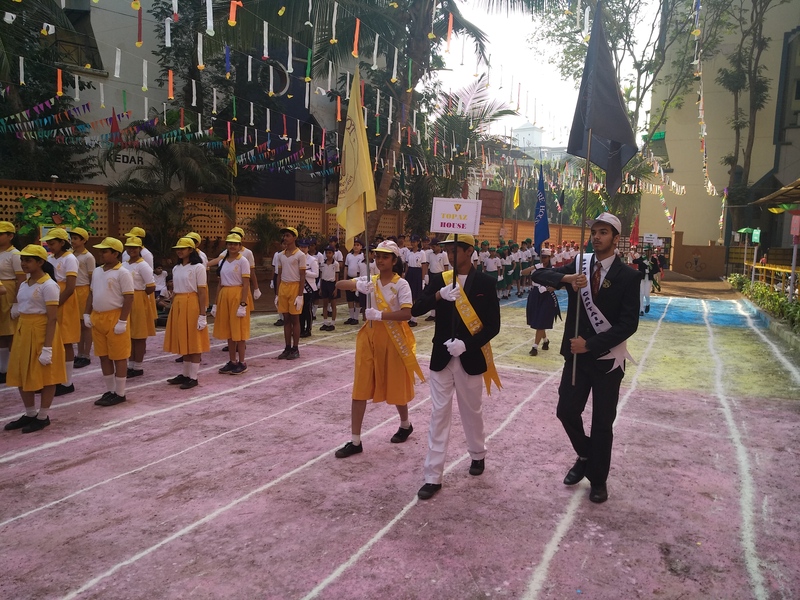 A well co-ordinated March Past by the Four Houses Ruby, Topaz , Emerald and Sapphire under the leadership of the Sports Captain was a feast to the eye. Lighting the torch marked the setting of track events with cheers and encouragement for the young athletes. 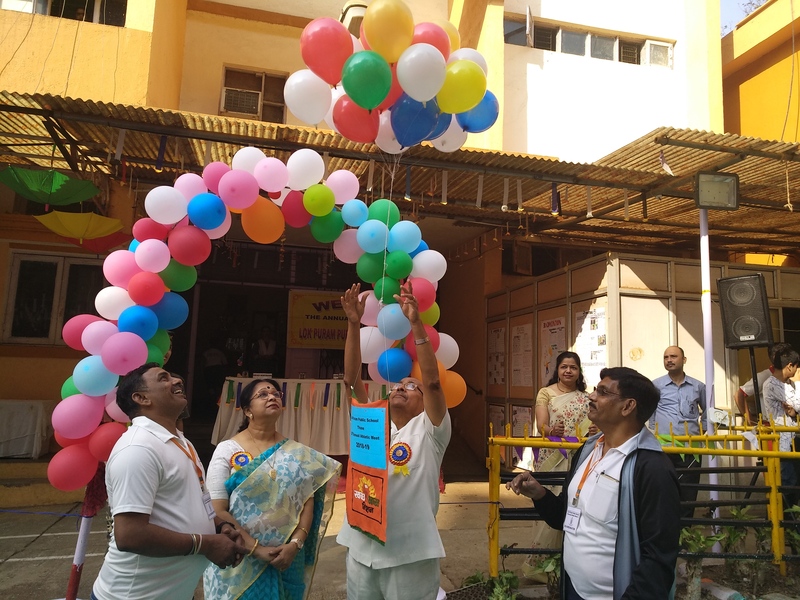 Colourful balloons were released in the open air with the message of Green and Clean, Thane in the Secondary Section. 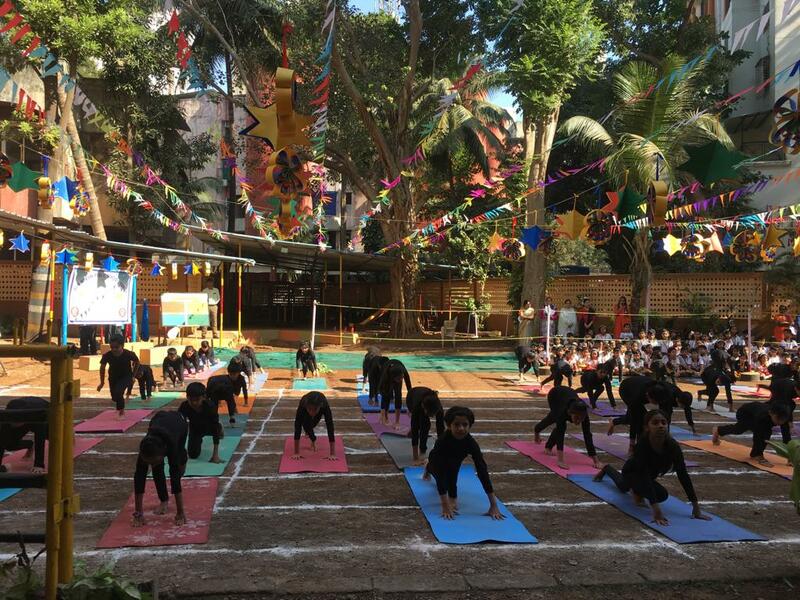 Carrying forth the enthusiasm, Yoga Display and Drill exercises were performed in all the Sections spreading the Colour of Championship. 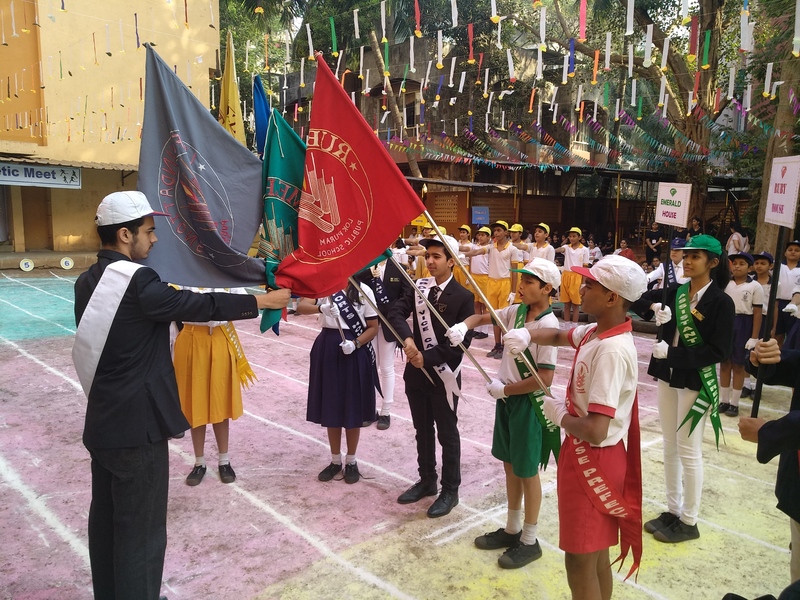 The Championship Trophy for the leading House was bagged by Emerald House in Secondary Section & Ruby House in Primary Section. 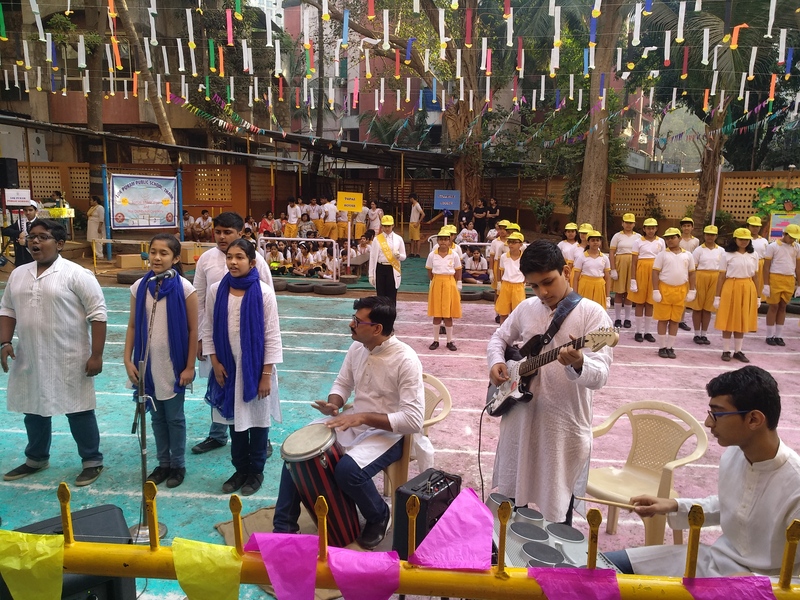 Besides this, Musical Chair for teachers added to the enjoyment. 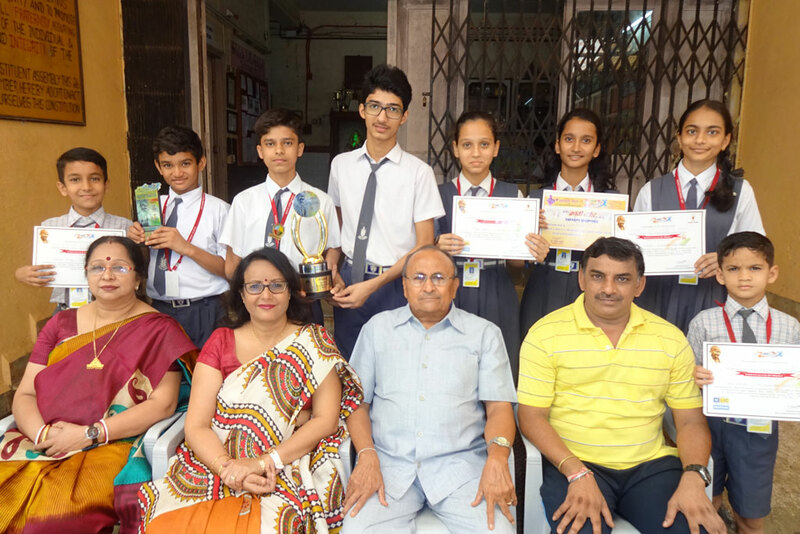 He won 3 Gold Medals in 200 mtr Free Style, 200 mtr Butterfly and 400 mtr Individual Medley in DSO District Level Swimming Competition organized by Thane Club on 4th September 2018. 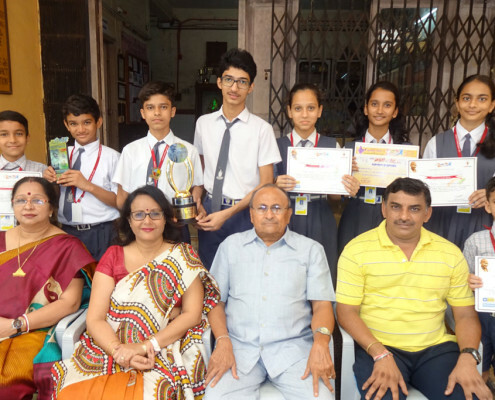 He received 3 Silver Medals in 200 mtr Free Style, 200 mtr Butterfly and 400 mtr Individual Medley in DSO Zonal Level Swimming Competition organized on 10th and 11th September 2018. Yash won Silver Medal in 200mtr Butterfly and Bronze Medal in 400 mtr Individual Medley in School State Level Swimming Competition organized by Nagpur District Aquatic Association between 1st to 4th October 2018 and was selected for 64th National School Games. 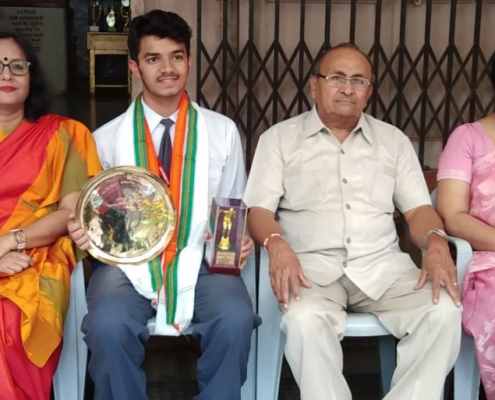 He won Bronze Medal in 200 mtr Butterfly in CBSE South Zone Swimming Competition held on 10th and 12th October 2018. In School Games Federation of India (DSO) held at District Level held on 22ndSeptember 2018, she won 3 Gold Medals in 500 mtr &1000 mtr Race and Road Race. At Zonal Level Competition held on 5th October 2018 she won Gold Medal in Road Race & Silver Medals in 500 mtr & 1000 mtr Race. She also bagged Gold Medal in 500 mtr and 2 Silver Medals in 1000 mtr Race and Road Race at the State Level Competition held between 14th to 17th October 2018 and qualified for the National Level with First Position. In CBSE South Zone Skating Competition held between 9th to 12th October 2018 at State Level, she received Gold Medal in 300 mtr Time Trial and Silver Medal in 1000 mtr and was selected for Nationals with First Position in 300 mtr & Second Position in 1000 mtr. 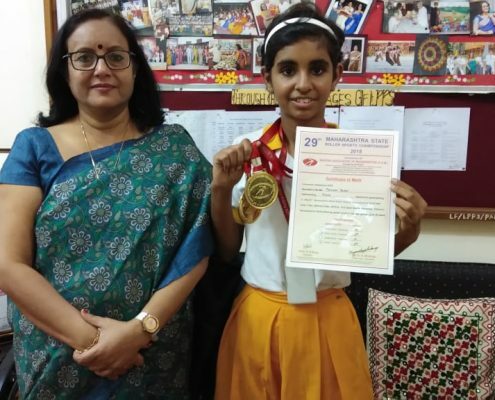 She won 2 Gold Medals in 1000 mtr Rink Race & 3000 mtr Road Race in the competition organized by Roller Skating Federation of India between 1st to 5th December 2018. Gold Medal in 600 mtr Run in Thane District Athletic Meet organized by Thane District Athletic Association in May 2018. Silver Medal in 400 mtr and 600 mtr Run in DSO Meet held in October 2018. 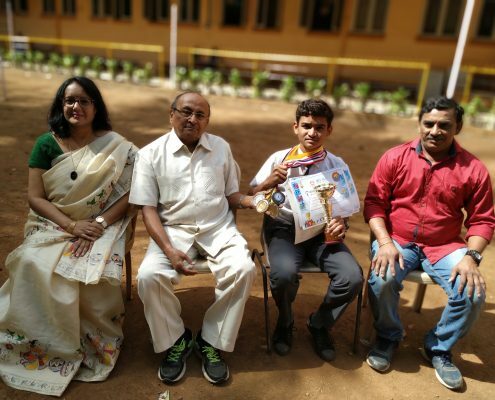 Bronze Medal in 800 mtr Run in the CBSE Athletic Meet organized in October 2018 and selected for State Level. 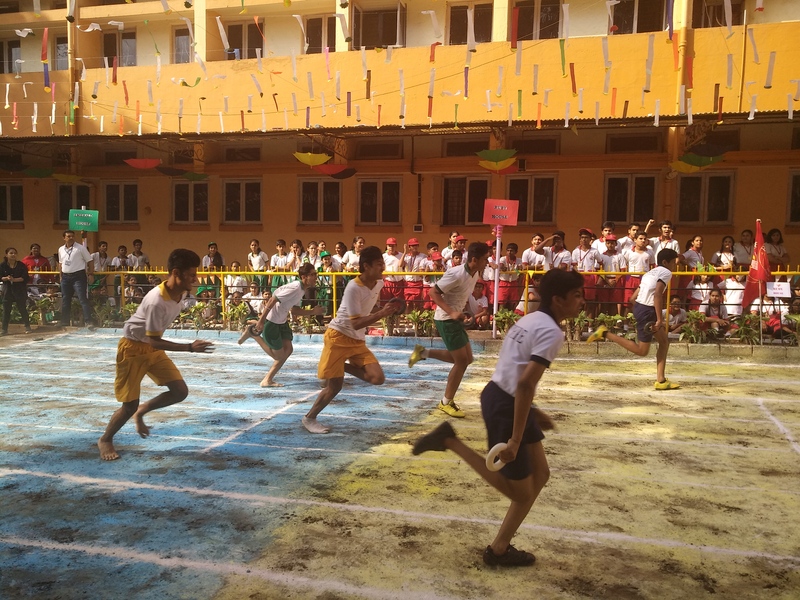 Gold Medal in Triple Jump in DSO Meet held in October 2018. Silver Medal in High Jump in the Athletic Meet organized by Thane District Athletic Association in May 2018. Bronze Medal in High Jump in the CBSE Athletic Meet organized in October 2018 and selected for State Level. 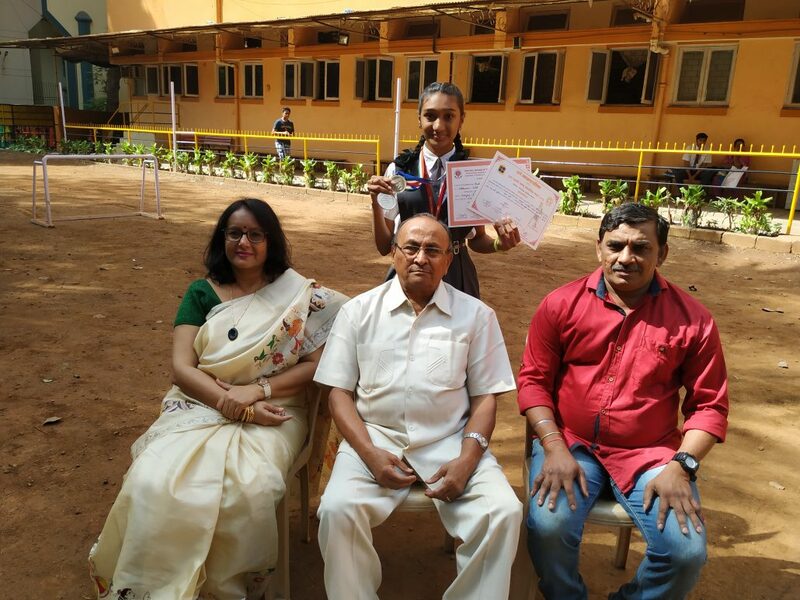 Soumitra Asanare of Std VII won Second Position in High jump in DSO Meet held in October 2018 & got selected for Zonal Level. 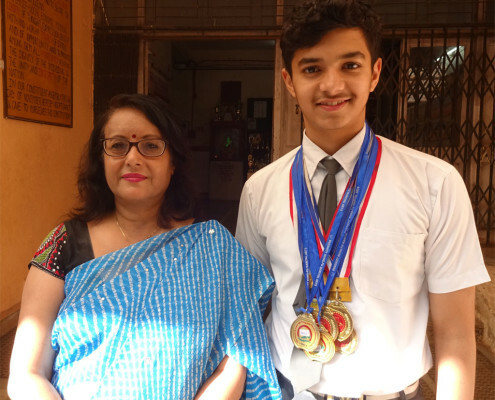 Yash Shinde (Std VIII) won Gold Medal in 200 mtr Run, Silver Medals in 100 mtr Run, 1000 mtr Run and Relay Race. Shagnik Das(Std VIII), Aman Prajapati (Std VIII) and Gourish Naik (Std VII) won Silver Medals in 400 mtr Relay Race. 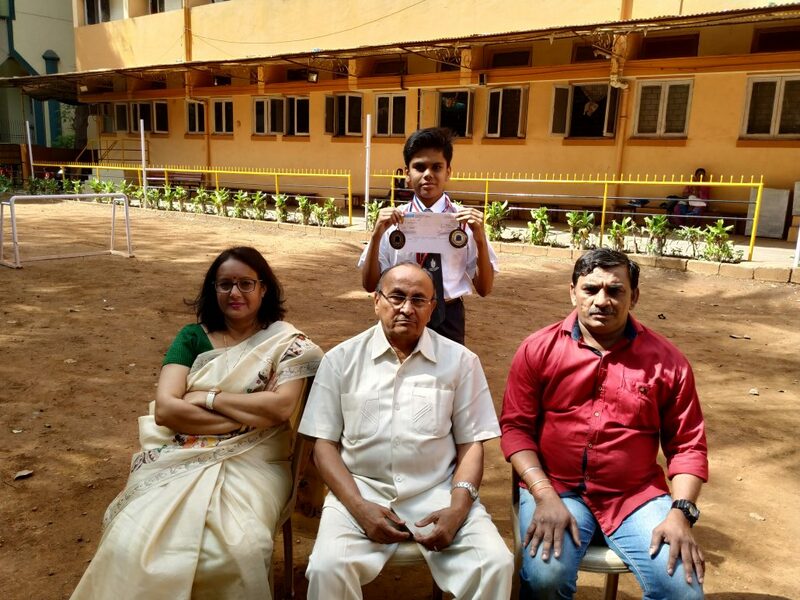 Arya Patil (Std VI) received Silver Medal in Shot Put. Jay Narayan (Std IX) won Bronze Medal in Shot Put. 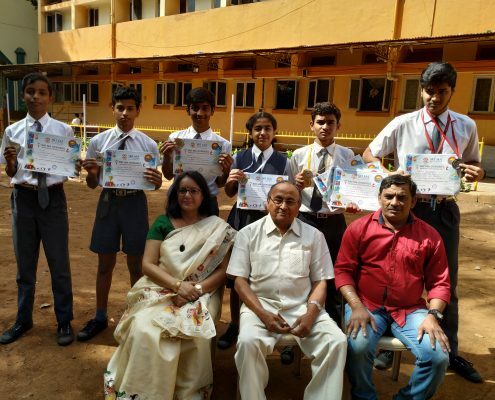 Gaurav Arya and Harshvardhan Jadhav of Std VI won Silver Medals in Relay Race. 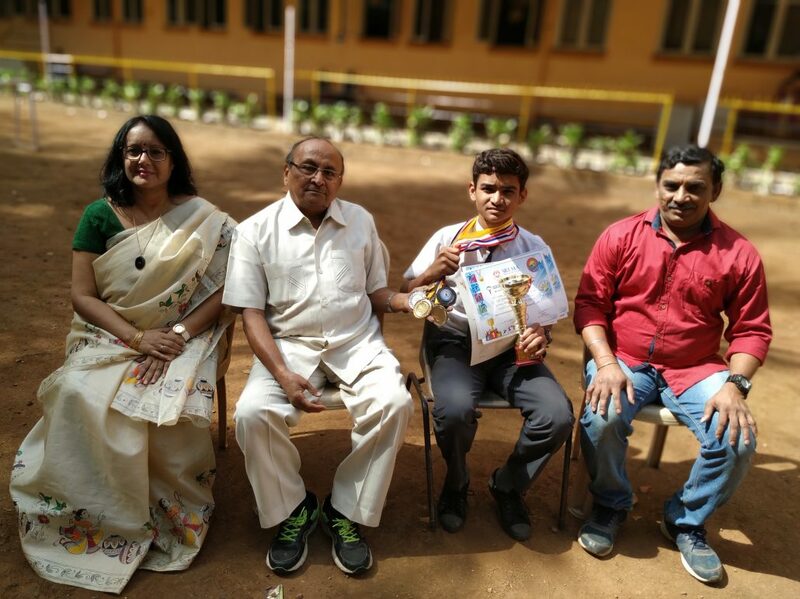 Yash Shinde (Std VIII) received Gold Medal in 300 mtr race and Bronze Medal in Relay Race. 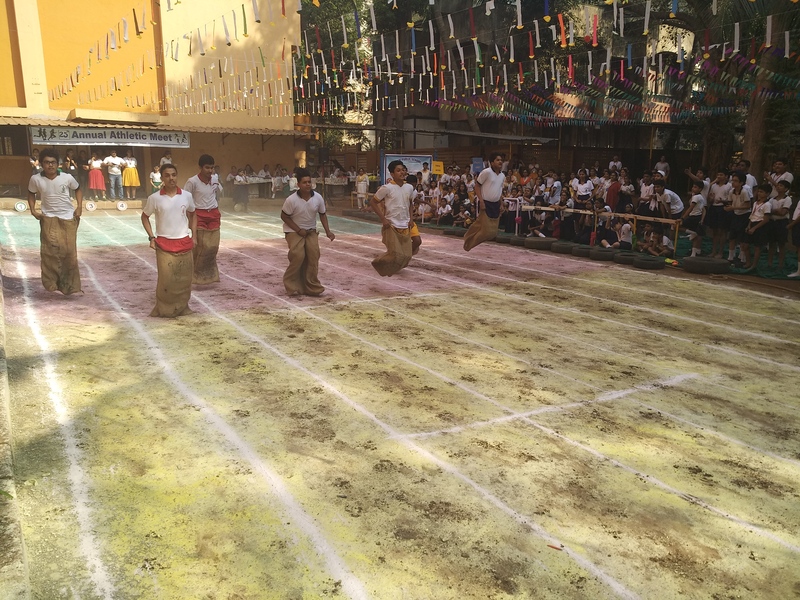 Gaurish Naik (Std VII), Aman Prajapati (Std VIII) and Shagnik Das (Std VIII) won Bronze Medals in Relay Race. 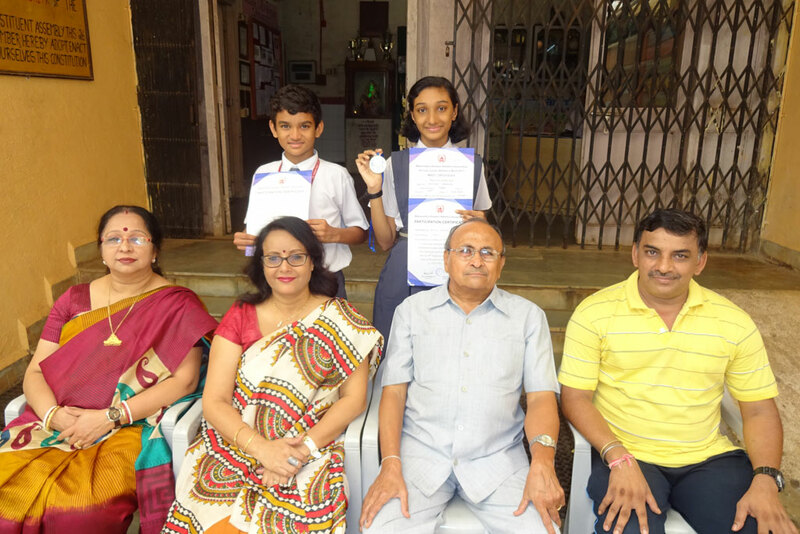 Arya Patil (Std VI) won Silver Medals in Shot Put and Relay Race. Yash Shinde (Std VIII) Gold Medal in 60 mtr Run and Silver Medal in Relay Race. 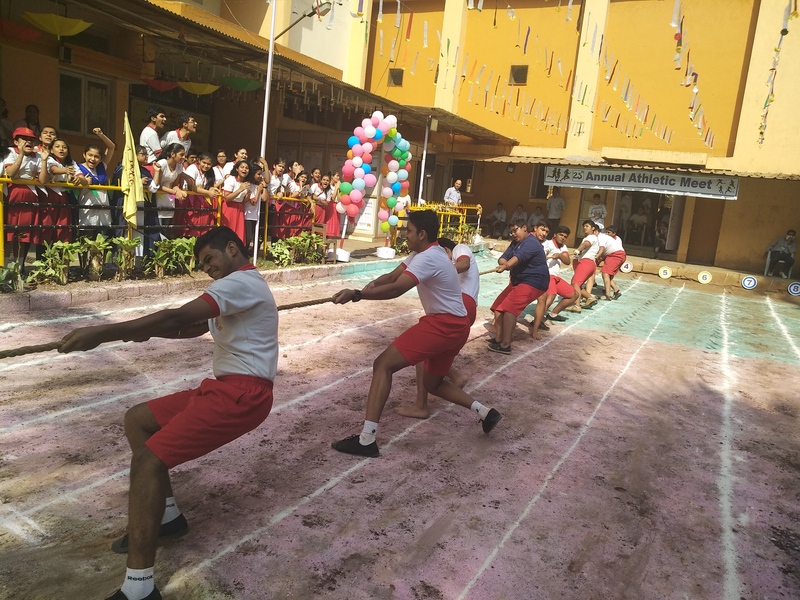 Rohan Sabu (Std VII), Aman Prajapati (Std VIII), Shagnik Das (Std VIII) won Silver Medals in Relay Race. 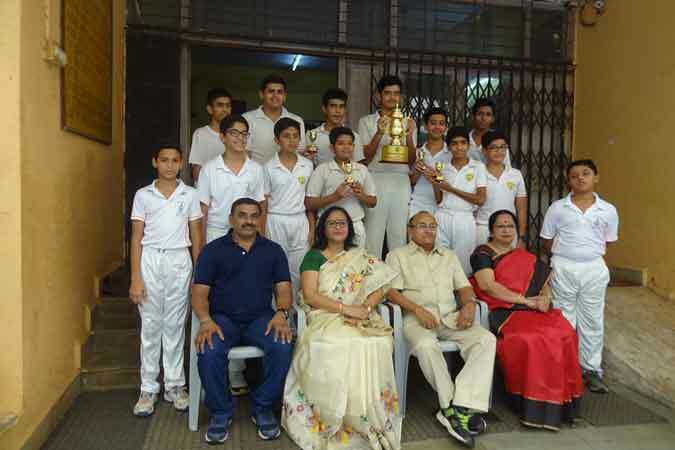 Our school Cricket Team received Winners Trophy– Under 16 Century Cup in Inter School Cricket Tournament organized by Pacers Group at Panaji, Goa in the month of November 2018. 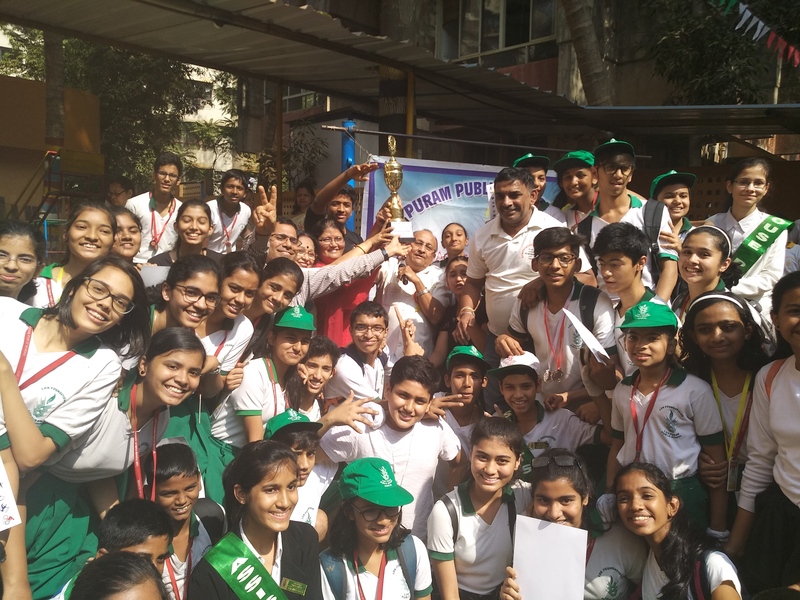 Our girls Cricket Team won Winners Trophy in Inter School Cricket Tournament organised by Ranjeet Foundation on 20th January 2019. 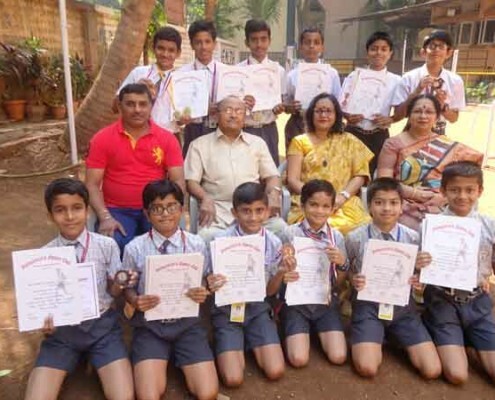 In Thane Mayor District Level Acrobatics Gymnastics and Artistic Competition organized on 16th February 2019, Vedant Patil of Std VII E won two Bronze Medals in Individual and Team Championship. 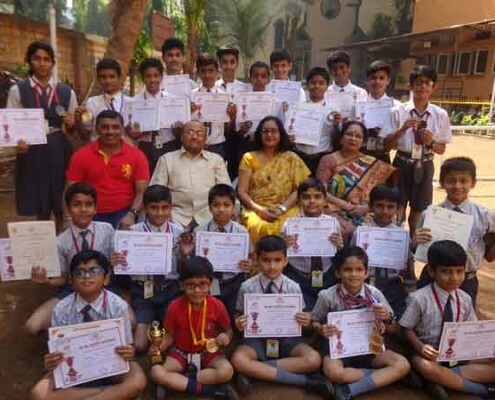 Our School Cricket team Under 10 bagged 3rd Prize Trophy in Singhania Inter School Cricket Tournament organized in May and June 2018.They also won the 1st Runner up Trophy in Singhania Inter School Cricket Tournament organized on 29th December 2018. 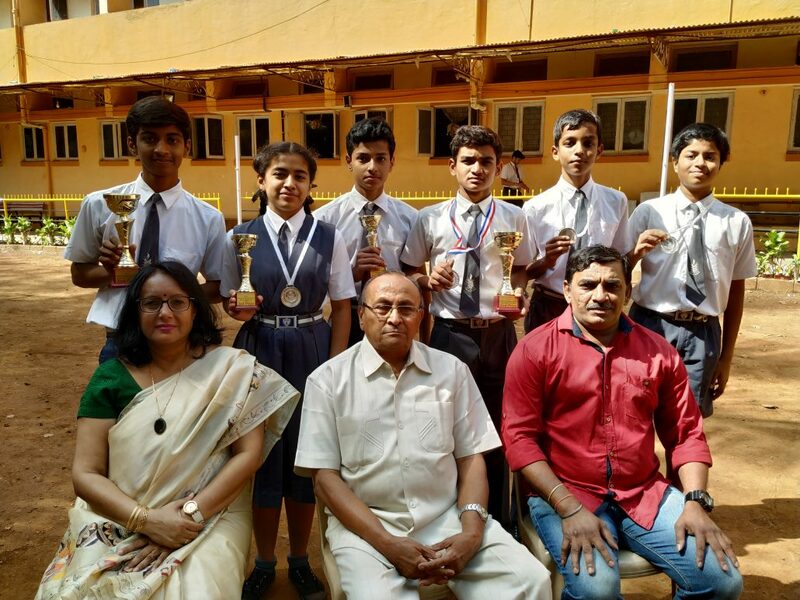 Manas Shinde of Std IV bagged Gold Medal in 80 mtr Run & 200 mtr Run in Thane District Athletic Meet. He has been selected for State Level Athletic Meet 2019 to be held on 2nd & 3rd March 2019. 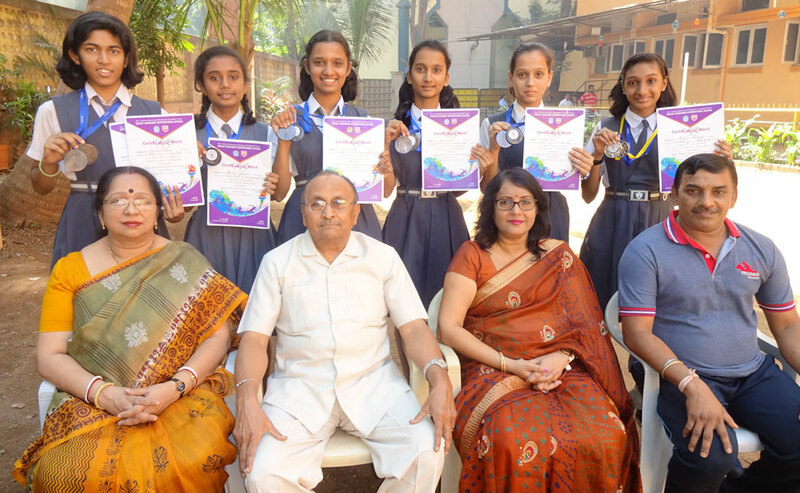 Gargi Ghosalkar (Std I), Veena Patole (Std II), Krisha Gore( Std II) & VihanaVinod (Std II) won Gold Medals in 4×50 mtr Relay. Irwyn Viegas, (Std V), Pranav Gangurde( Std V) bagged Silver Medals in 4×100 mtr Relay . Manas Shinde(Std IV), Naitik Sharma (Std III),Ojas Shinde (Std III) & Varad Boyane( Std IV) got Bronze Medals in 4x50mtr Relay. Arnav Akolkar (Std II),Kavish Gore( Std II), Rushank Deshpande ( Std I) &Venantius Nadar( Std II) won Bronze Medals in 4×50 mtr Relay. 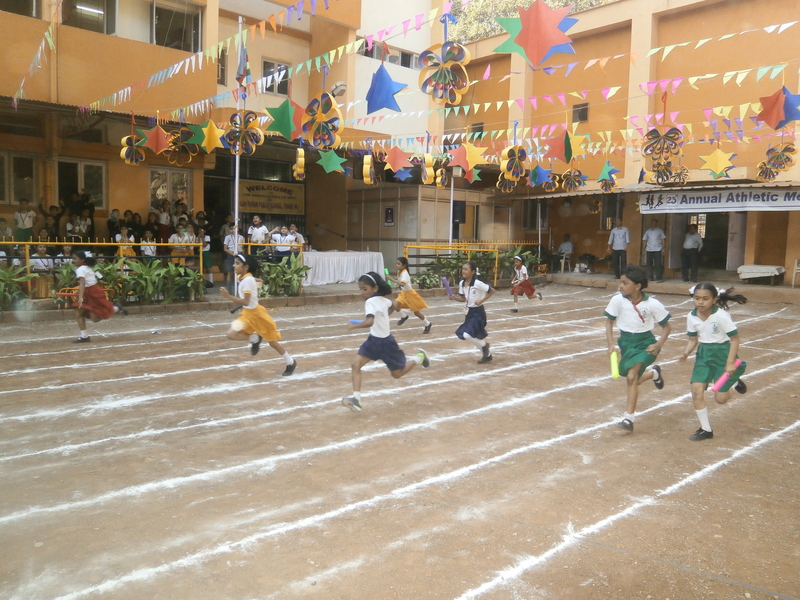 Manas Shinde (Std IV) got a Gold Medal in 100 mtr Run and a Silver Medal in 300 mtr Run. Arnav Akolkar (Std II) got a Bronze Medal in 50 mtr Run Race. 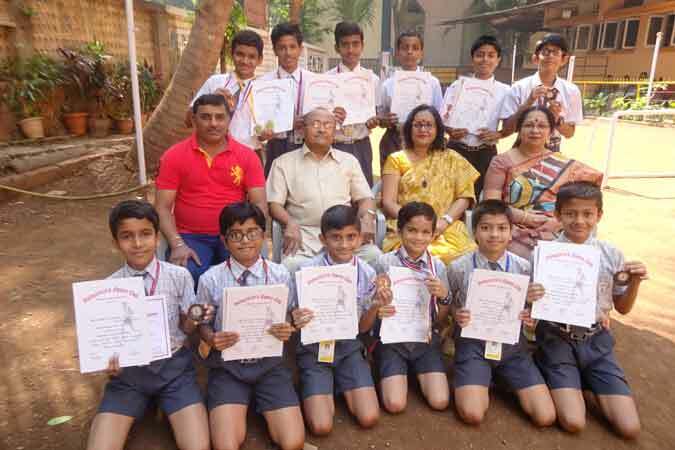 Manas Shinde (Std IV) bagged Gold Medals in 50 mtr Run and 150 mtr Run. Keya Tandel (Std V),Jiya Mehta(Std V) & Siya Acholkar (Std V) grabbed Silver Medals in 4 x 150 mrt Relay. 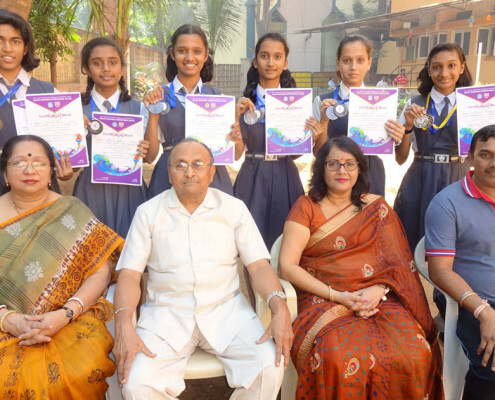 Gargi Ghosalkar (Std I), Veena Patole (Std II), Krisha Gore( Std II)& VihanaVinod (Std II) grabbed Silver Medals in 4×75 mtr Relay. 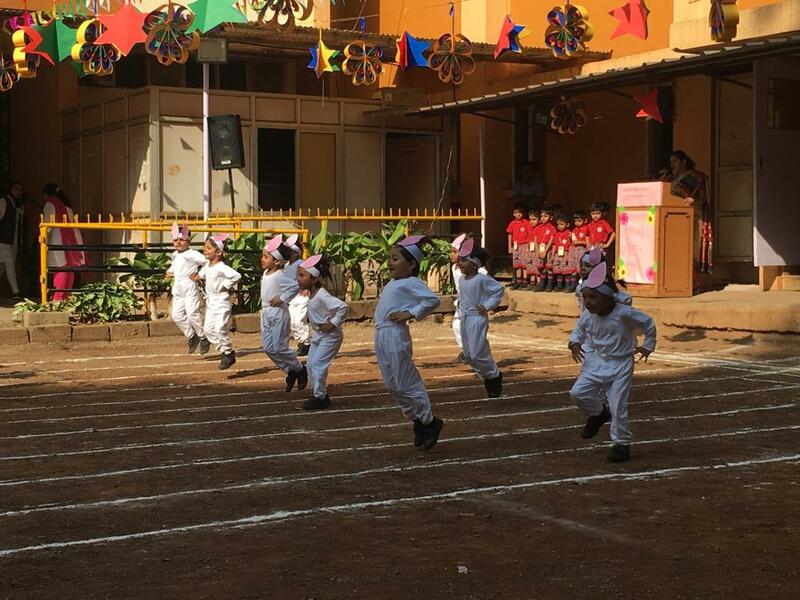 Navika Basu (Std I ), Navya Bandooni (Std I ) & Akshita Ganeshan (Std II) won Bronze Medals in 4 x50 mtr Relay race. Arnav Akolkar (Std II) bagged a Bronze Medal in Long Jump. 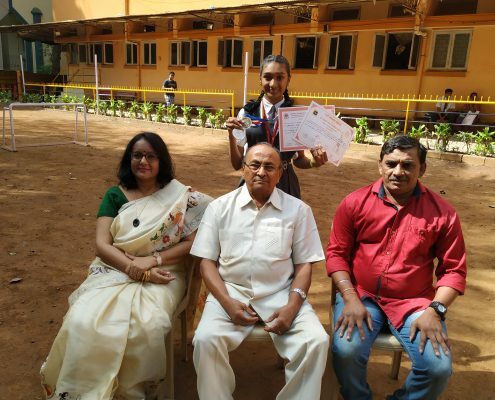 In the Thane Mayor’s Chashak Athletic Meet 2019 organized by TMC on 16th ,17th and 18th February 2019, Manas Shinde (Std IV ) grabbed Gold Medals in 80 mtr Run and 200 mtr Run. 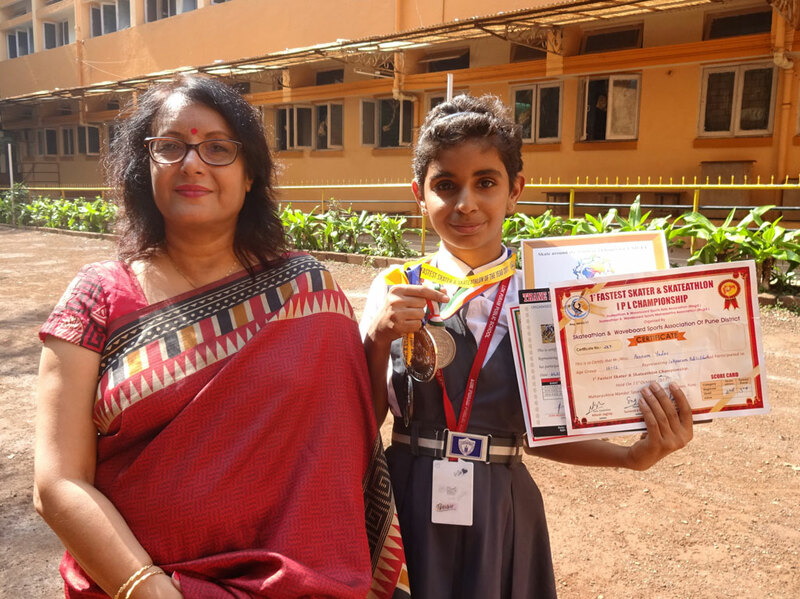 Vaishnavi Asanare (Std X) received First Prize in Long Jump, Second Prize in Relay Race and Third Prize in 60 mtr Run. 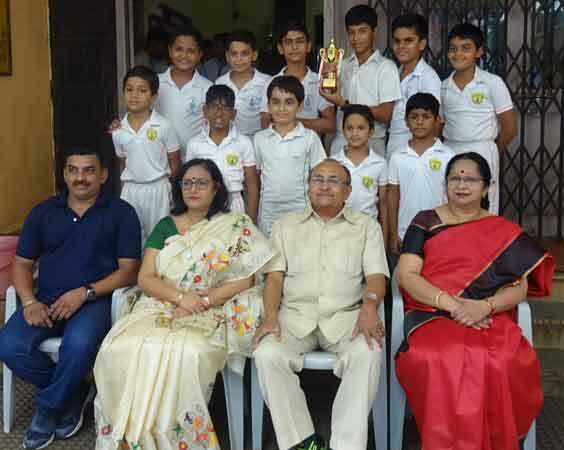 Yash Shinde (Std VII) bagged First Prize in 600 mtr Run. 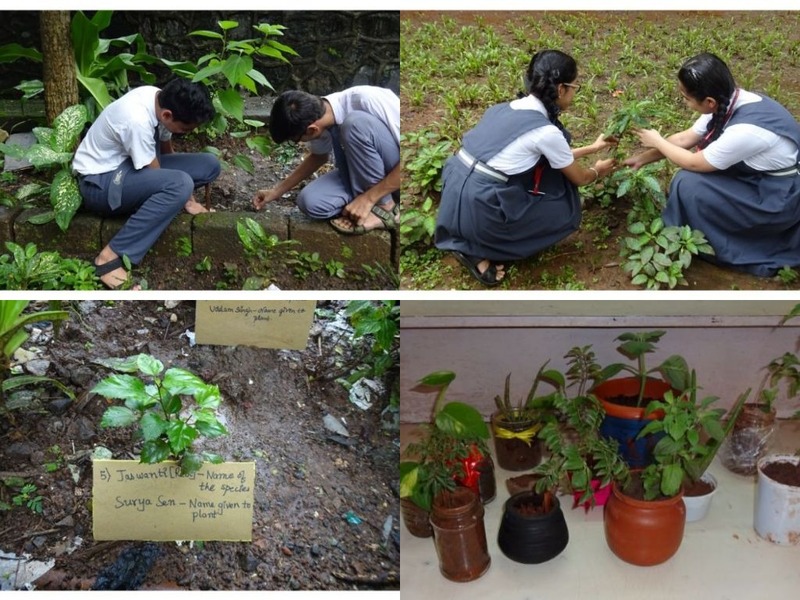 Prapti Arora, Devaki Gokhale and Shruti Mahesh of std X won Second Prize in Relay Race. 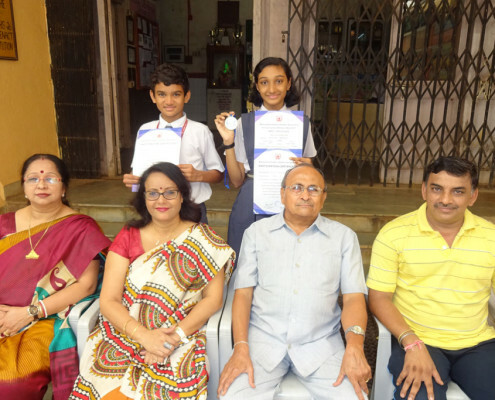 Anshula Narkhede (Std VIII) received Third Prize 600 mtr Run. 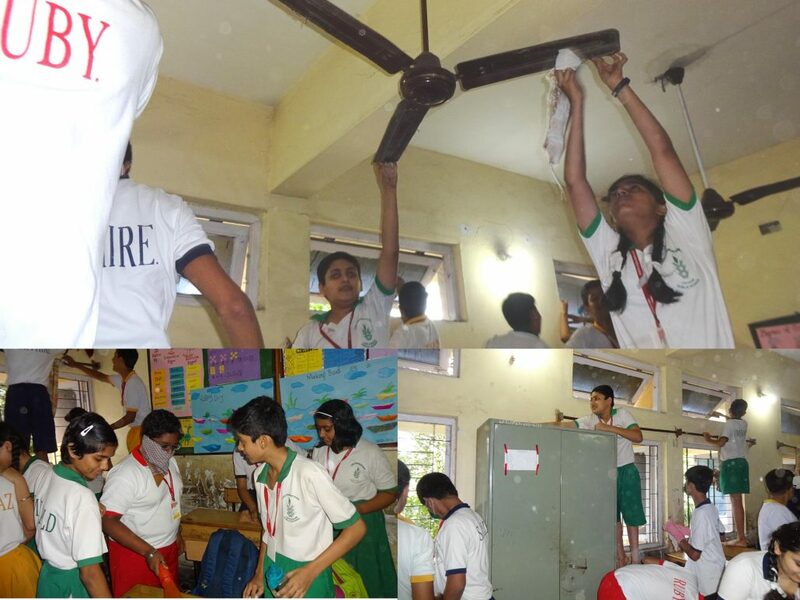 Soumrita Asnare (Std VI) and Rohan Salsa Std (VI) won Third Prize in Relay Race. Arya Patil (Std V) bagged Gold Medal in Shot Put. Manas Shinde(Std III) won Bronze Medal in Long Jump. Gaurav Arya (Std V), Harsh vardhan Jadhav (Std V) grabbed Bronze Medals in 400 m Relay race. 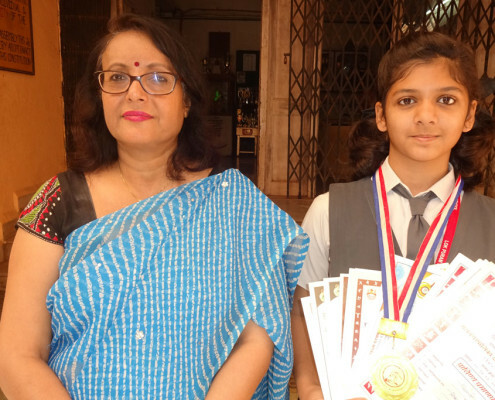 Soumrita Asnare (Std VI) won Gold Medal in High Jump. Yash Shinde (Std VII) bagged Gold Medal in 600 mtr Run. 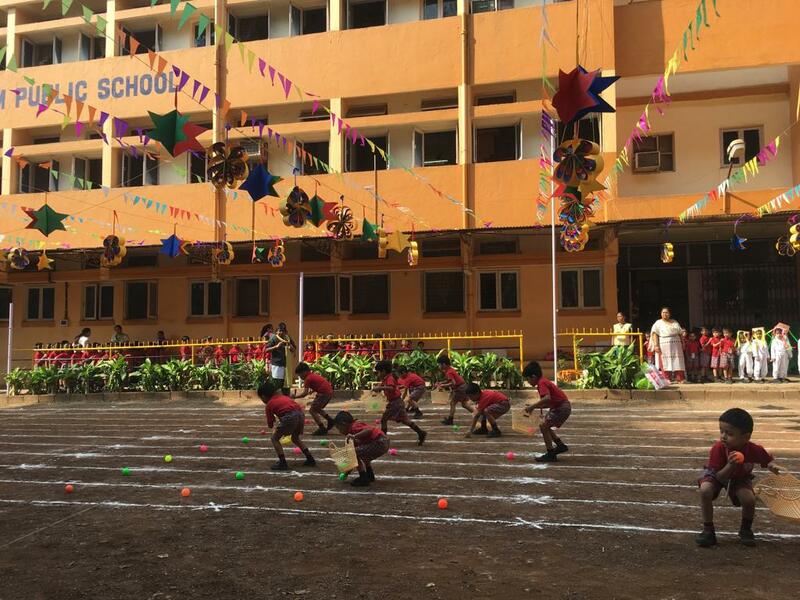 Vaishnavi Asanare (Std X) grabbed Silver Medal in Long Jump. Anshula Narkhede (Std VIII) received Bronze Medal in High Jump. 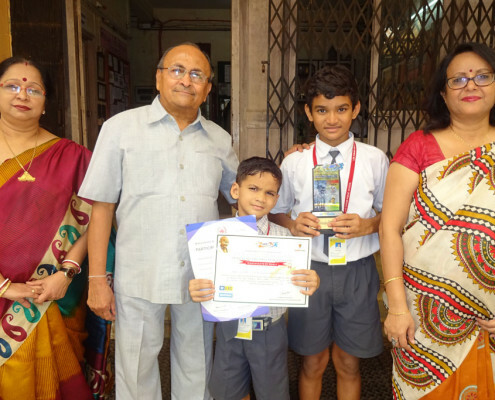 Soumitra Asanare and Rohan Sabu (Std VI) received Gold Medals in 4 x 150 mtr Relay Race. Yash Shinde (Std VII) won Bronze Medal in 60 mtr Run and 4 x 150 mtr Relay Race. Shagnik Das (Std VII), Gourish Naik (Std VI) & Aman Prajapati (Std VII) bagged Bronze Medals in 4 x 150 mtr Relay Race. 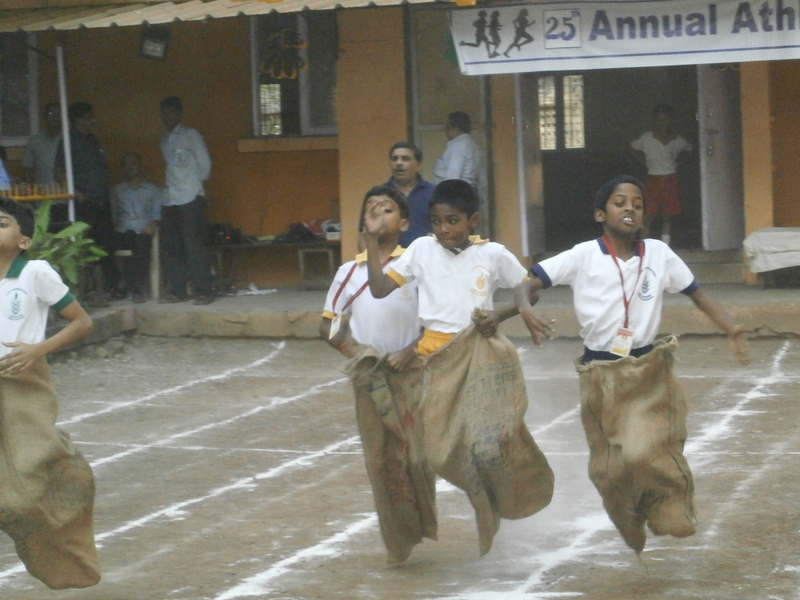 Manas Shinde (Std III) bagged 3 Gold Medals, one each in 60 mtr Run, Long Jump & Relay Race. 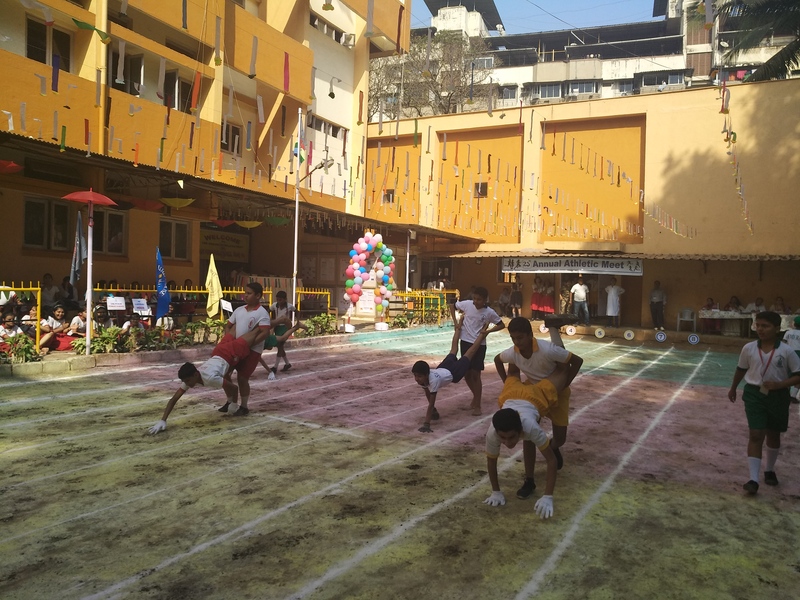 Simon Sabu (Std IV), Pranav Gangurde (Std IV), Gaurav Arya (Std IV), & Harsh vardhan Jadhav (Std V) won Gold Medals in Relay Race. 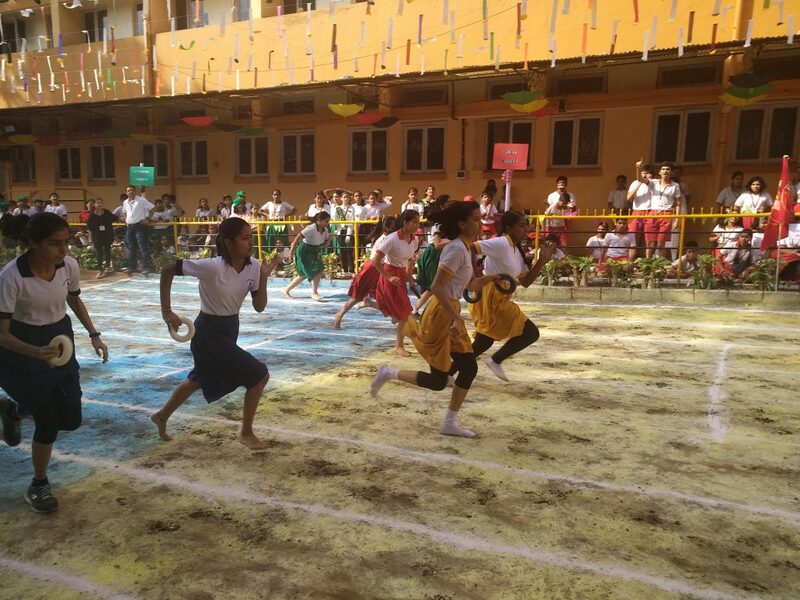 Irwyn Viegas (Std IV) grabbed a Gold Medal in Relay Race & a Bronze Medal in 60 mtr Run. Yash Shinde (Std VII) bagged Gold Medal in 1200 mtr Run & Silver Medal in 4 x 100 mtr Relay Run. 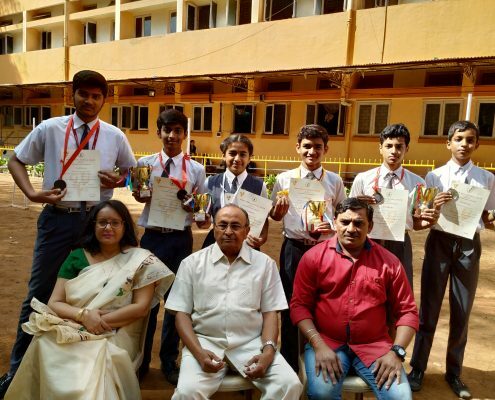 Yash Deshmuk, Yash Thorat, Jatin Chaudhary and Parth Manjrekar (Std X) won Gold Medals in 4 x 100 mtr Relay Run. 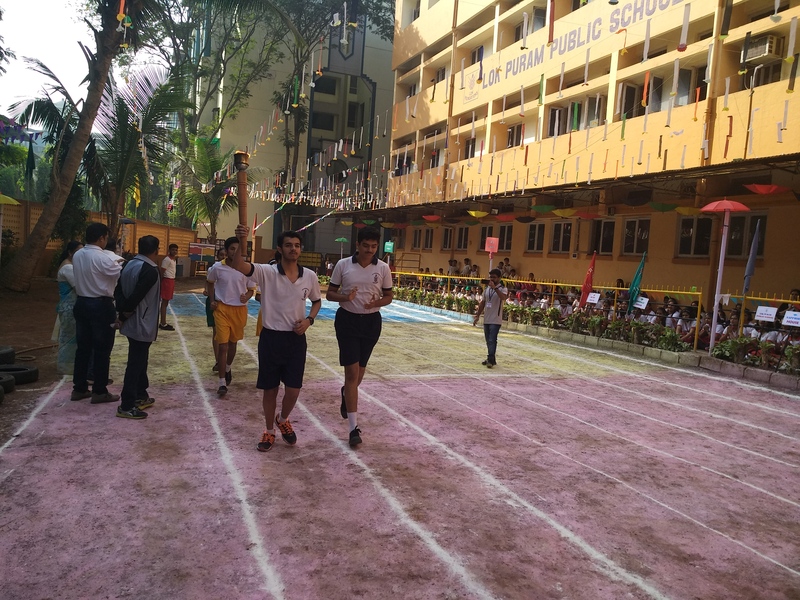 Soumitra Asanare and Rohan Sabu (Std VI) grabbed Gold Medals in 4 x 100 mtr Relay Run. 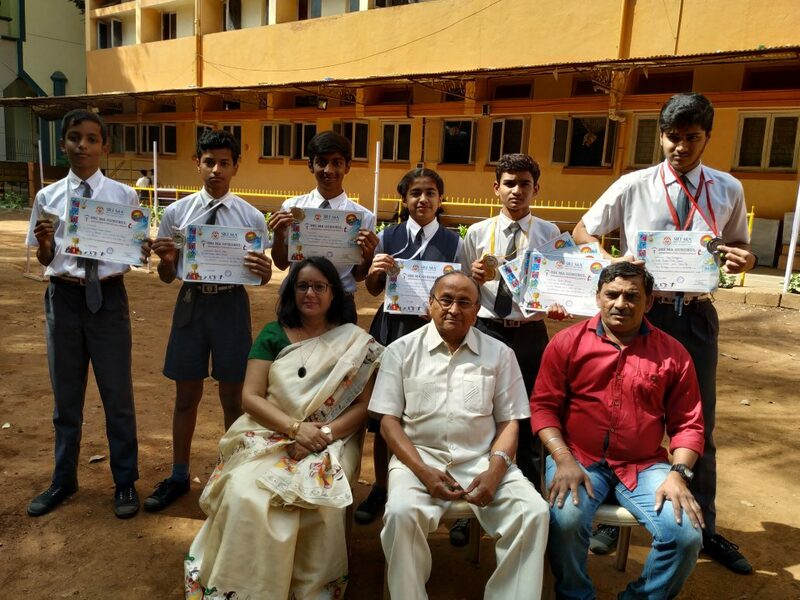 Gourish Naik (Std VI), Shagnik Das and Aman Prajapati (Std VII) received Silver Medals in 4 x 100 mtr Relay Run. 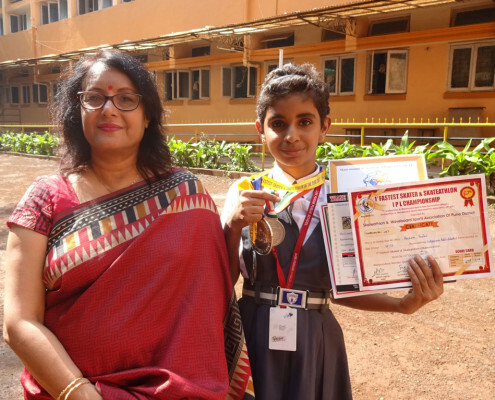 Vaishnavi Asanare (Std X) received Bronze Medal in Long Jump. Gaurav Arya (Std V),Harsh vardhan Jadhav (Std V )bagged Gold Medals in 400m Run. 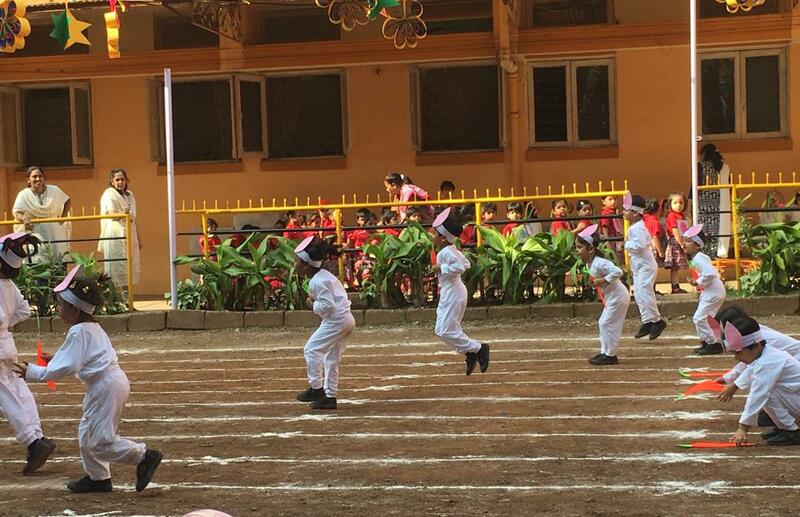 Manas Shinde (Std III) grabbed a Silver Medal in Long jump and a Bronze Medal in Relay Race. 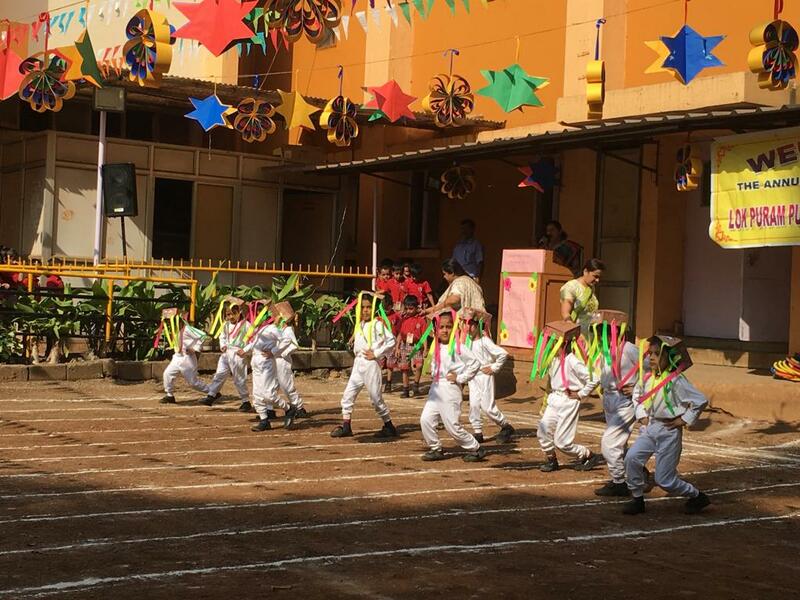 Pranav Gangurde (Std IV) achieved a Bronze Medal in Relay Race. Chirantan Valanju (Std II), Saksham Nishant(Std II), Varad Boyane (Std II) &Ojas Shinde (Std II) won Bronze Medals in 200 m Relay Race. Yash Sonak of Std X has made an outstanding feat in the field of swimming and made the school proud by securing 9th position in 75th World’s Longest Open Water Swimming Competition at Murshidabad, West Bangal on 26thAugust,2018. He swam 19 kms in 2 hours 19 minutes in river Bhagirathi where 39 participants from various countries like Spain, Argentina, Sweden, Bangladesh and India participated. He was honoured with an Uttariya Gold Plate and a Trophy in this prestigious event. 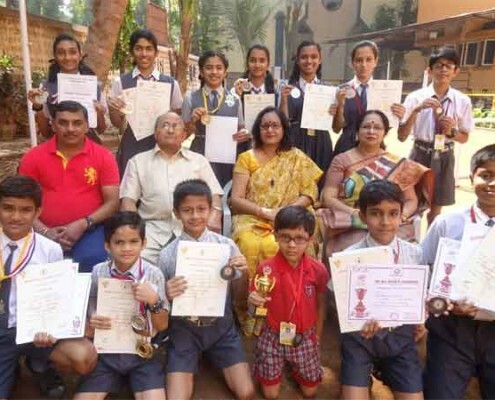 Yash Sonak also won Four Gold Medals and a Trophy in 100 mtr Breast Stroke, 200 mtr Individual Medley, 100 mtr Butterfly Stroke and 100 mtr Free style in 5th Inter School Junior College Swimming Competition 2018 organised by Bombay YMCA on 20th January 2018. 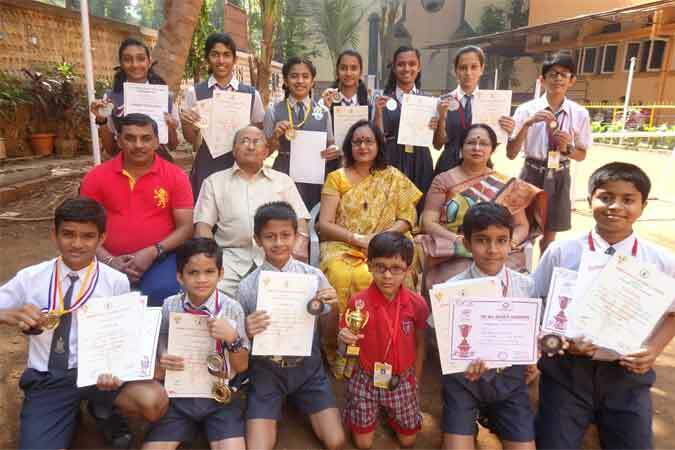 He also bagged a Gold Medal and Trophy in 250 mtr Sprint and Gold Finisher Medal, Trophy and Cash Prize in 2 km Swimmalthon in National Goa Swimmalthon Competition Organised by Endura Sportson 24th& 25th March, 2018. He also won a Bronze Medal & Certificate in State Aquatic Championship organised at Ahmednagar by Ahmednagar District Amateur Aquatic Association on 29th, 30th, 31st May 2018. Yash Thombare of Std IX won Runners up Trophy in Maharashtra State Open Badminton Tournament held between 9th February 2018 to 11th February 2018. He also won a Bronze Medal in Fit Badminton Masters Cup 2018 at District Level held on 19th to 21th January 2018. 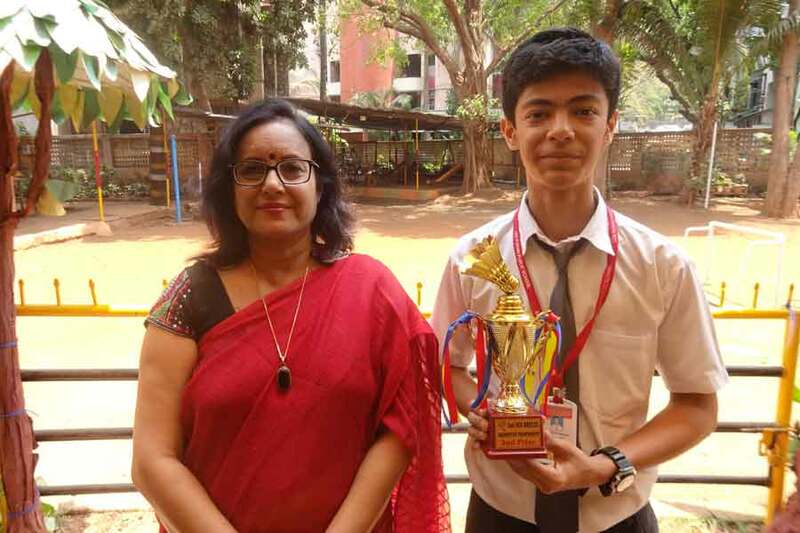 He is also the proud recipient of Winners Trophy in (Under – 17) Boys Doubles & Runner Up Trophy in (Under -17) Boys Singles in 2nd Sea Breeze Badminton Tournament organized between 29th April 2018 to 1st May 2018. 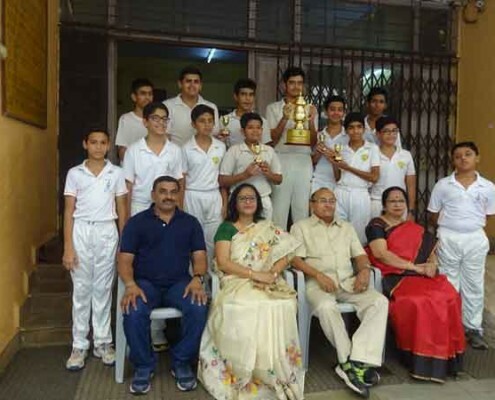 In the Singhania Inter School Cricket Tournament organized in the month of May and June 2018 , the boys Under -14 team won 2nd Runner Up Trophy and the boys Under – 10 team bagged 3rd Prize Trophy. 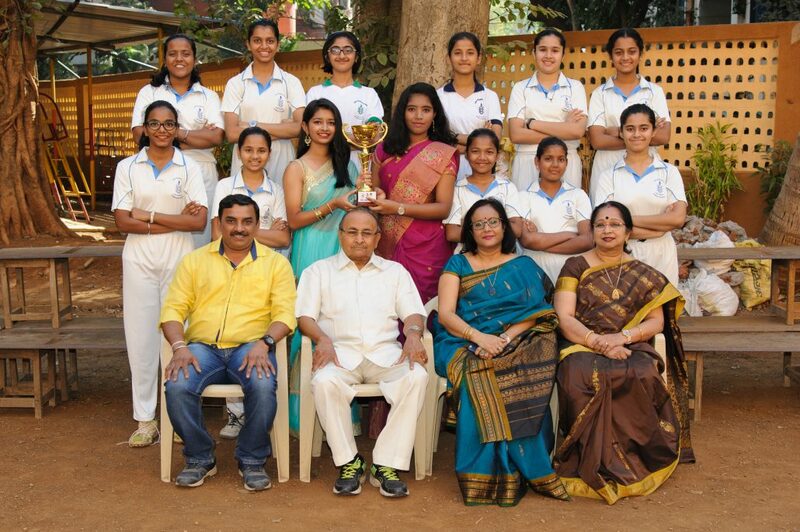 In the Inter School Cricket Tournament organised by Shri Ma Vidyalaya on 5th May 2018 our Girls Cricket Team won Third Prize – Emerging Team Trophy. 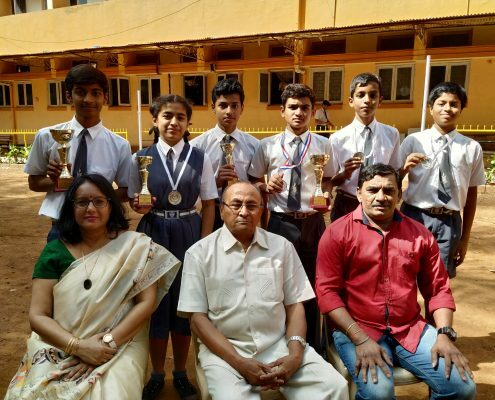 In 21st District Level Aquatic Championship held on 8thJan 2017, he won four Gold Medals and one Silver Medal. 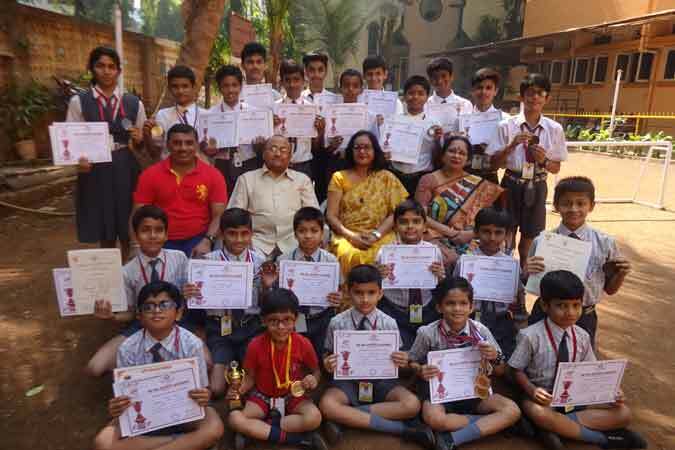 In 5th Annual Swim Gala 2017 organised at District Level by FR Agnel Multipurpose School & Jr. College, Vashi on 27th February 2017,he won Individual Championship Trophy,threeGold Medals & three Silver Medals. In Speedo Goa Swimmalton 2017 organised on 8th& 9th April 2017 by Enduro Sports, he won Silver Medal in 2 Km Swimming in 14 yrs category. 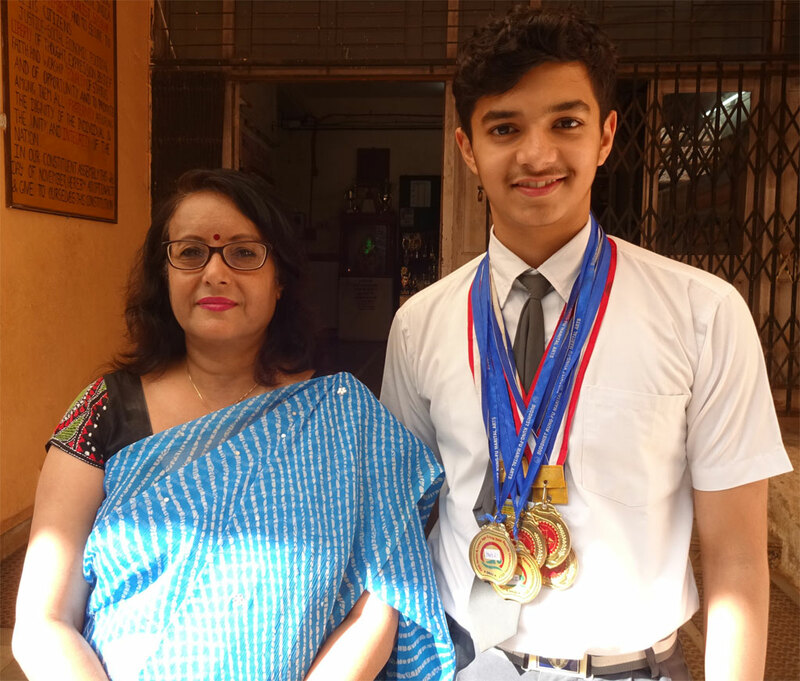 In the selection of State Championship by Thane District Amateur Aquatic Association, he won Five Gold Medals in 100 mtr&200 mtr Butterfly, 200 mtr Freestyle, 200 mtr and 400 mtr Individual Medley on 6th and 7th May 2017. In the 34th Sub Junior and 44th Junior State Aquatic Championship, he won Silver Medal in 200 mtr Butterfly and Bronze Medalin 4×100 mtr Medley Race. In Senior & Lower Age Group State Aquatic Championship 2017 organized by Maharashtra State Amateur Aquatic Association on 9th & 10th September 2017, he won 7 Gold Medals, 3 Silver Medals and 3 Bronze Medals in different categories. He also won 2 Gold Medals in 100 mtr Freestyle & 200 mtr Butterfly in the DSO Swimming Championship organized on 25th September 2017. He won Silver Medals in200 mtr- Butterfly, 400 mtr- Individual Medley in DSO Inter School Zonal Level Swimming Competition held on 16th& 17th October 2017. ChinmayeeDusane of Std X won two Silver Medals in Individual and Group Category in 23rdAcrobatics Gymnastics State Championship 2016-17 organised by Maharashtra Amateur Gymnastics Association on 24th and 25th Feb 2017. She also received Gold Medal in Women’s Pair & Silver Medal in Women’s Trio Acrobatic Gymnastics in 16th Mumbai Mayor Cup State Level Championship held on 26th and 27th May 2017. . She also won Gold Medal in State Level Acrobatics Gymnastics held on 4th November 2017 and was selected for Zonal Level. 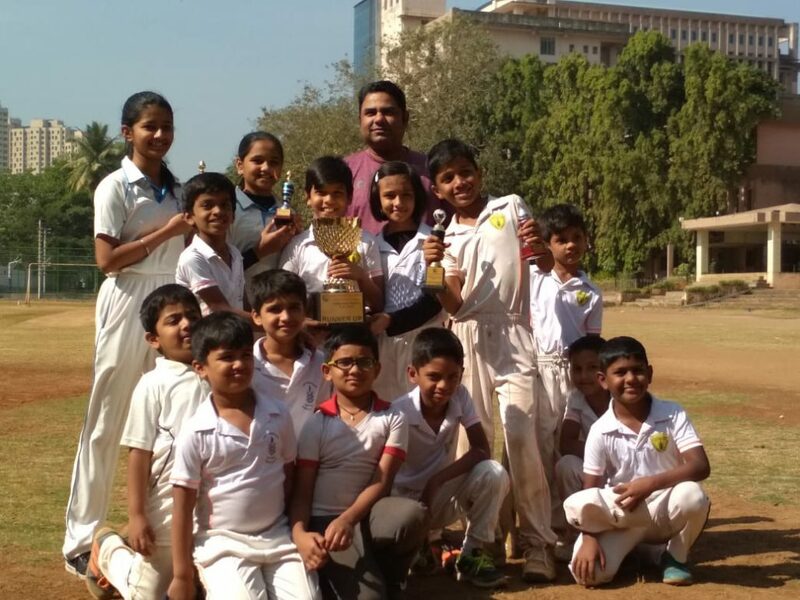 In Singhania Trophy held on 23rd April 2017 our school Cricket Team (Under 14) won the match against Euro school. 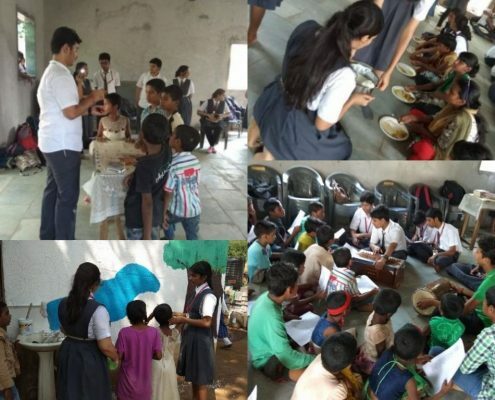 The team comprised of Soham Pitkar, Nisarg Shah, Jainam Kataria and Naman Hiran of Std IX, Nirav Revankar and J. Radhakrishnan of Std VIII. Our School Cricket Team bagged the Winners Trophy in the West Zone T-20 Cricket Tournament (Under-12) organized in May 2017. 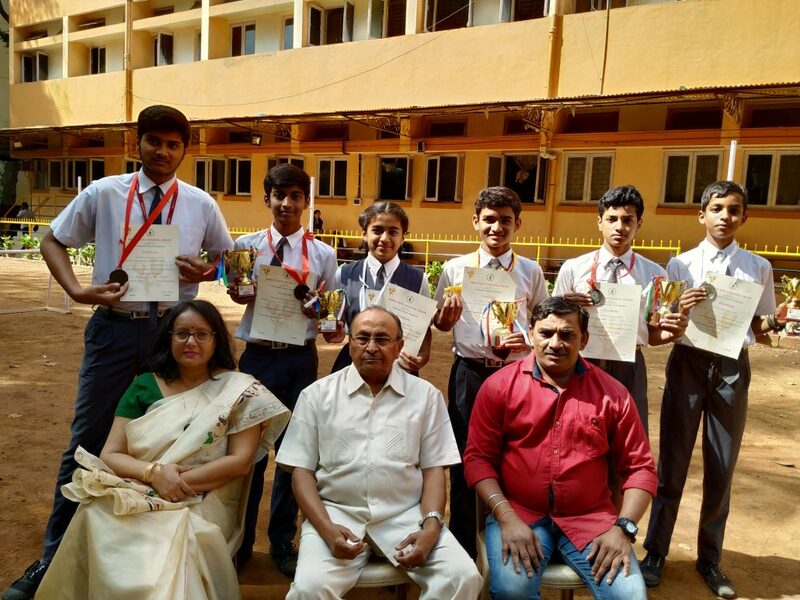 Several schools of Maharashtra participated in the prestigious league Matches.The team members were: Dhruv Kedar (Std VI), Dhruv Sonak (Std VII), Shreyas Srinivasan (Std VII), Niket Ganesan(Std VIII), Naman Hiran (Std IX),Soham Pitkar (Std IX). The Girls Football team of our school reached upto the Semi Finals in the DSO Subroto Football Championship organized on 18th July 2017, after winning the match against Hiranandani Foundation School. 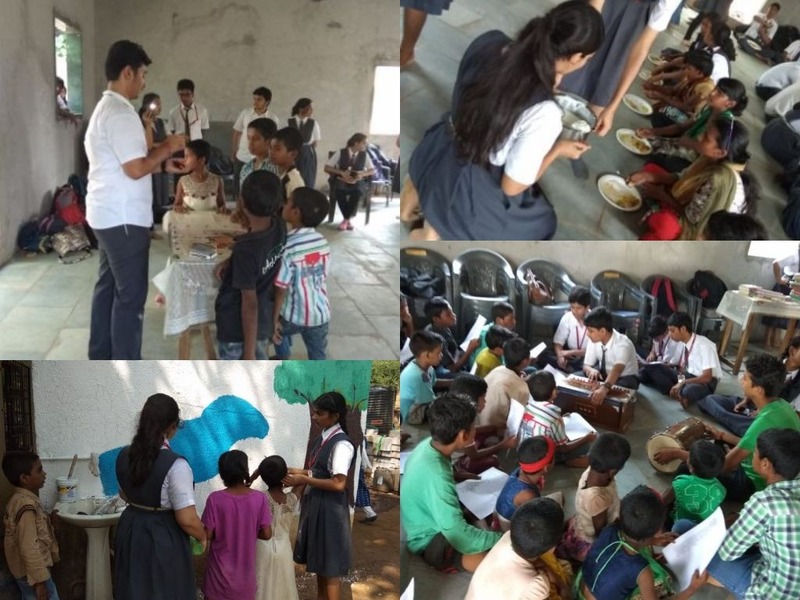 The team comprised of the following students : Prapti Arora , Sharvani Shetty, Dynashree Thombre , Sayuri Dhore, Shruthi Mahesh, Jhanvi Nair, Surabhi Dalvi, Janhavi Jadhav, Ishita Gupta, Muskan Pandey, Zheel Sagar, Pranjal Sonawane and Gunjan Pandey of Std X, Nikita Desai and Sonika Kale of Std IX. The Boys team of our school reached upto the Semi Finals in the DSO Subroto Football Championship organized on 26th July 2017, after winning the match against Saraswati High School. 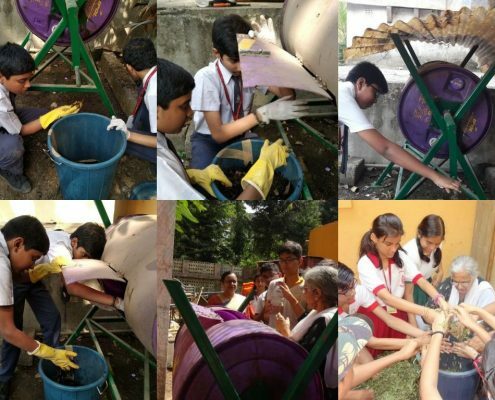 The team comprised of the following students : Nirav Revankar , Niket Ganesan, J. Radha krishnan, Akhil Nair, Aarav Kitsu, Devansh Prabhu, Siddhant Vernekar, Sagar Ingrulkar, Uddhav Bokil, Atharva Joshi, Aryan Moharil, Rishabh Srivastav, Aakash Godave of Std VIII. 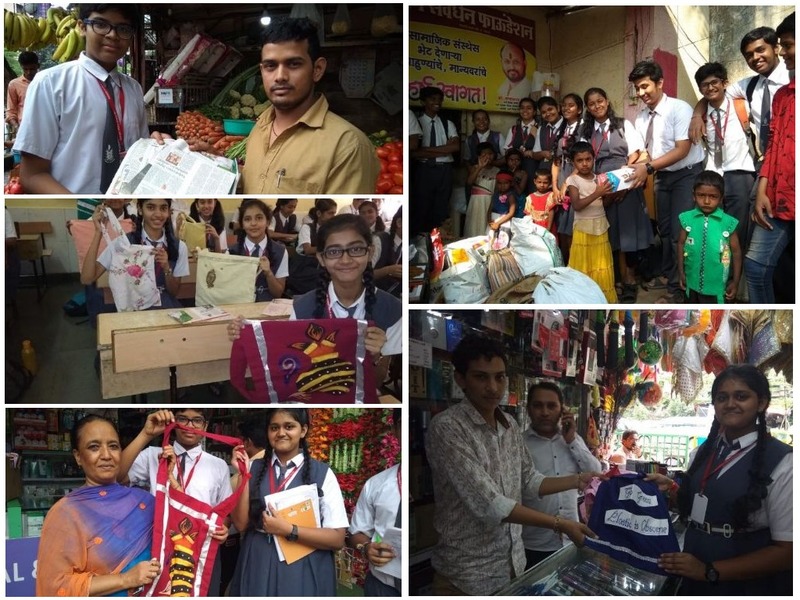 Our school is the recipient of Overall Winner’s Trophy in 8th KrantiDaud (Run for ChaleJao) organized by the NGO Aapan Sare on6th August 2017. 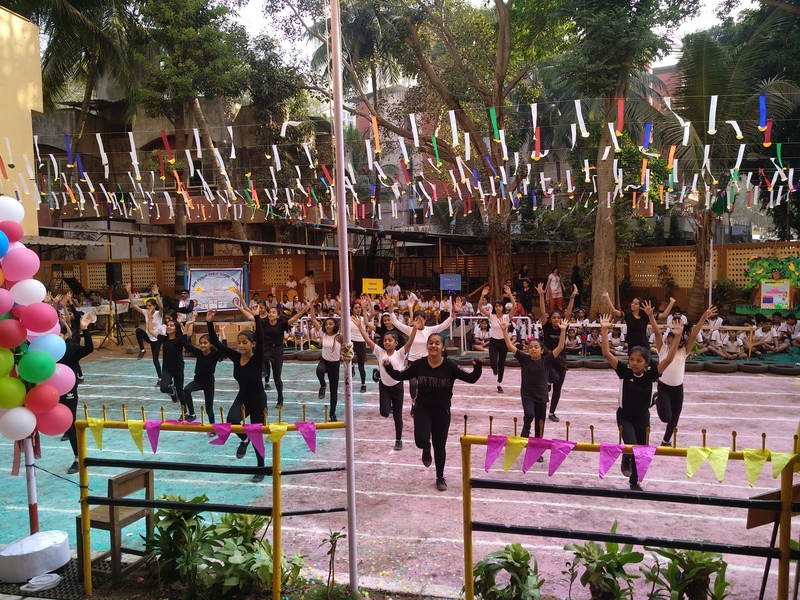 26 Schools participated from in & around Thane.The run was organized for a distance of 2 kms to 10 kms in various categories as a mark of 75th Anniversary of Quit India Movement and to pay a tribute to the freedom fighters. The winners along with our coach- Mr. Rakesh Yadav were felicitated by International Para-Athelete Mr. Devendra Jhajharia who is the recipient of Padma Shri Award, Arjuna Award and Rajiv Gandhi KhelRatna Award. Siddhi Dubey Std X (2016-17 batch) bagged Silver Medal in Triple Jump. Anshula Narkhede (Std VIII) won Silver Medal in High Jump. Prapti Arora (Std X) bagged Bronze Medal in 800 mtr Run. Yash Shinde (Std VII) received Bronze Medal in 600 mtr Run. In the Maharashtra State Athletic Championship held from 18th August 2017 to 20th August 2017, Anushula Narkhede of (Std VIII) bagged Bronze Medal in High Jump and Yash Shinde (Std VII) got 5th Position in 600 mtr Run. 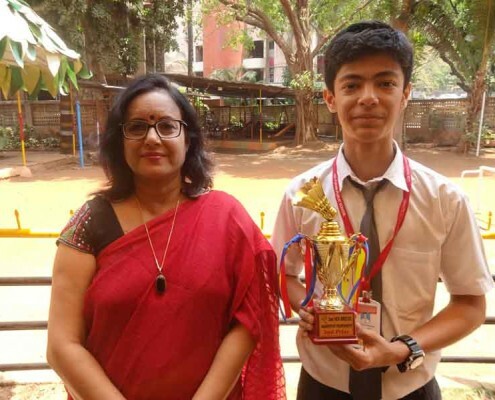 In the DSO Athletic Meet held on 24th September 2017, Yash Shinde of Std VII bagged a Gold Medal in 100 mtr Run. 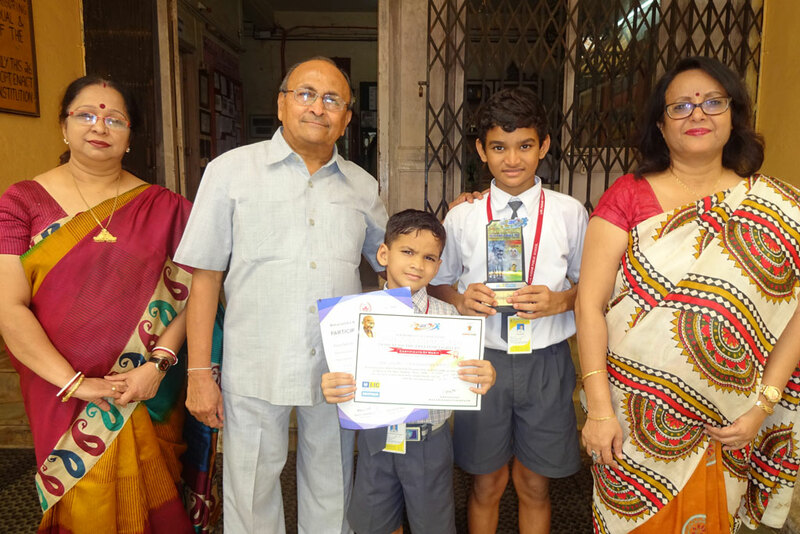 He has been selected for Zonal Level Competition. Our athletes are being regularly coached by our P.T. 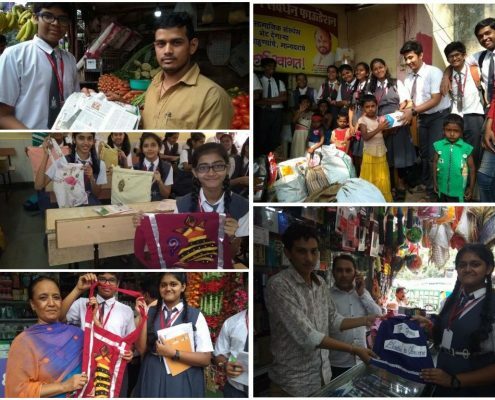 Instructor – Mr. Rakesh Yadav. Parnam Yadav of Std VII won two Gold Medals in Skating 1000 m Rink & 3000m Sink in DSO Meet held on 2nd October 2017. He also won Gold Medal in 1000m Rink & Silver Medal in 3000m Sink in Zonal Level Skating Competition organized by DSO on 30th October 2017. 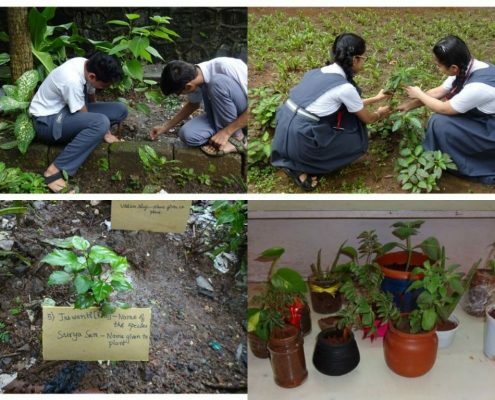 She has been selected for State Level contest. 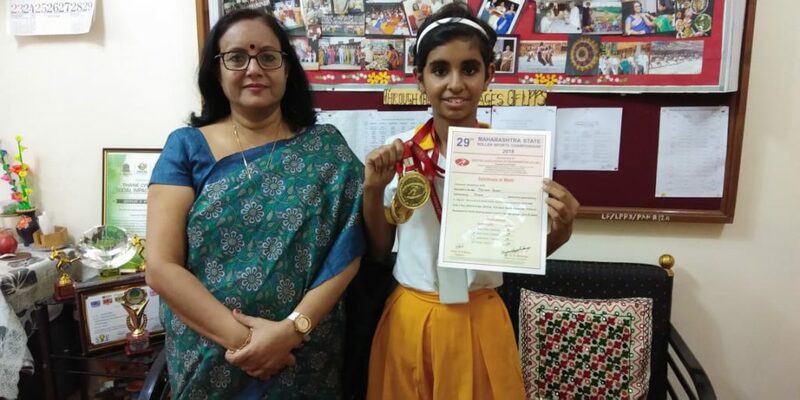 Parvati Narayan of Std VIII received Gold Medal in Judo Championship and Silver Medals in Kumite Championship & Combination Championship in District Level Marshal Federation organised by World Limited Marshal Arts Federation, China. Maithali Amin of Std VI won Gold Medal & Certificate in Karate contest organized by DSO on 2nd October 2017. 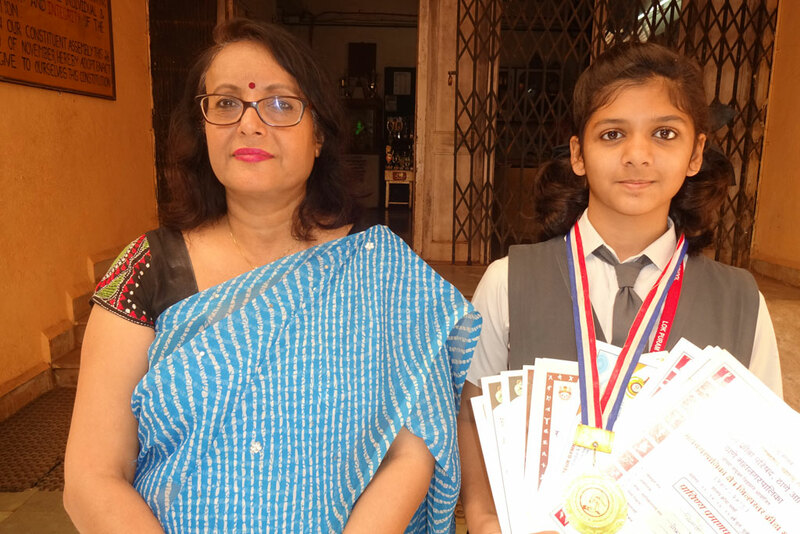 She also bagged a Silver Medal & Certificate in Karate contestat the Zonal Level in DSO Karate competition held on 30th October 2017. 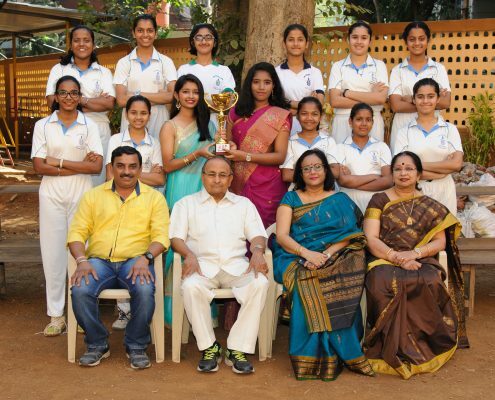 Agnes Jeena of Std IX and Sayali Mahagaonkar of Std VII have been selected for Mumbai Cricket Association from Thane in Girls Cricket Tournament (Under17) organized by DSO.